As much as you can, set a specific homework time and stick to it every day. Keeping it consistent will help both you and your child. Your child does better when he knows what is expected, and you can bypass the struggle of getting him to start his homework if it is the same time every day. This is also why it's important to have a dedicated homework area, as it's much easier to stay on the routine when the time and place is always the same. 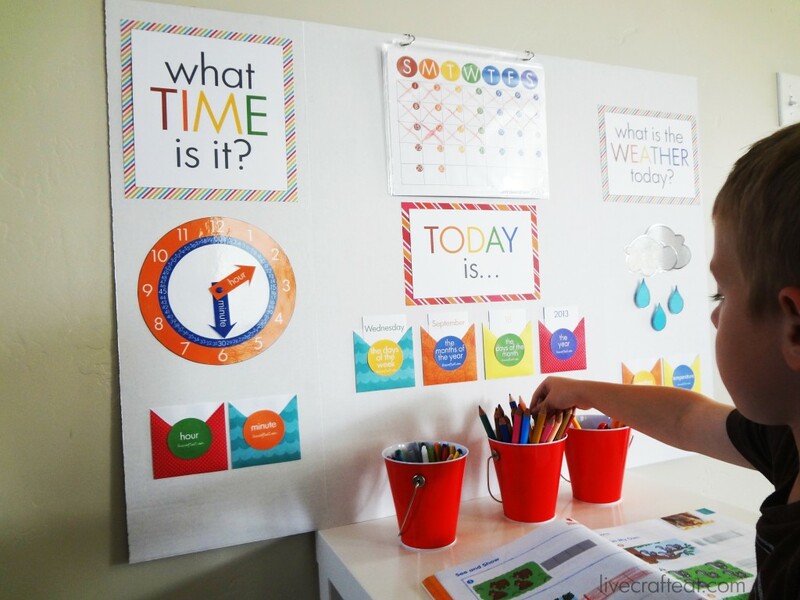 Your homework station can be set up in your child's room, a corner in the kitchen or at the joint family office space, but try to choose a spot where you can permanently leave the homework tools, so you don't have to set it up and clean it away every day. 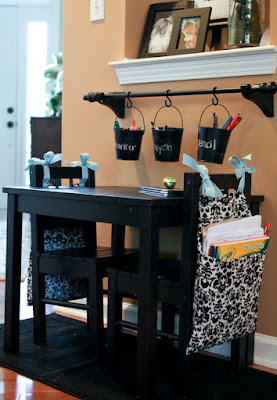 If your homework station is a joint desk, try to make sure that any clutter is cleared away. 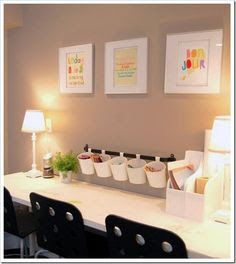 Your child needs a large, clear area to spread out their work and your bills or notes can get in the way. Likewise if the desk is in your child's room, try to keep it clear of toys or other trinkets that can be a distraction during homework time. Clutter-free doesn't have to mean boring though, we don't want to make this the "corner of doom" where your child gets sent to serve their homework sentence. If there is space, add some of your child's art work and let them have a say in decorating it with fun pencil holders and desk caddies. Make sure the homework station is stocked with any supplies your child might need while completing their work: pencils, erasers, scissors, paper are some basics. Depending on your child's age you might also need a calculator, dictionary, stapler, colouring supplies, glue etc. The idea here is that you don't want your child to have to get up and start searching for the right supplies once they sit down and start working. Everyone learns in a different way so any other tools that might help your child focus can also be added to your homework station. Some children have wiggly bums and need a squishy cushion to sit on. If their work requires reading or listening, fidgets might be helpful. For some, listening to music while working helps, although for others this can be a distraction - you know your child best. Try to keep homework time as distraction free as possible. TV, tablets and/or phones should not be on or nearby until homework is completed. With the exception of music which may help some children as mentioned in the previous section, we want this time of day to be as quiet and focused as possible. To get your child more settled, it might help for them to do some sort of physical activity ahead of time, if you have the time. Let them blow off some steam with outside play if possible, or find a safe way to get some indoor exercise (mini-trampolines can be good or any fun games that gets your child moving for 15-20 minutes). If your child has a hard time focusing for longer periods of time, set a timer for 5 or 10 minutes (or shorter or longer depending on your child) where they get to get up, do some jumping jacks, do a crab walk around the house or another physical activity that will get the jiggles out. We don't want them to get distracted with play here, and the break should be short so they don't get too off track, but just long enough so they can mentally focus for the next session. We'd love to hear your success stories, or obstacles to successful homework time. Connect with us on Facebook, Twitter, in store or by leaving a comment below!